The public, the student, and even health-care practitioners need more biographical exposure to people with mental illnesses. The only way to really grasp the nature and diversity of mental illness is via empathy. Brains have no moving parts and x-rays, MRI's and autopsies come up decidedly short for imparting understanding. More importantly, mental illnesses frequently need an intimate, real - world perspective to be best understood. 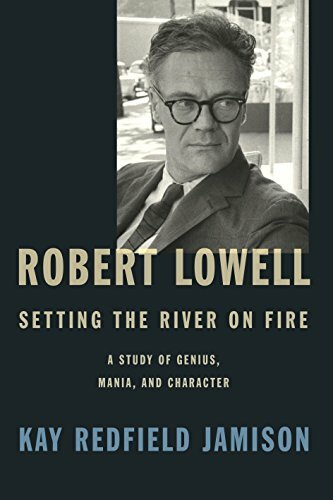 Kay Redfield Jamison helps fill this gap with a study of Robert Lowell. Writing as an academic, Jamison presents a biographical dissertation on Lowell, the patient and the poet, that trends to unabridged. However, even to someone unfamiliar with the man, she brings him alive in a manner that engages. I received this book in a giveaway lottery - I am not deeply into author biographies. Hence, twenty percent of the way into it, I wondered if I would finish it given its narrow focus on someone with whom I have little familiarity. I am pleased to say that I did and am glad to have done so. Jamison writes in an energized style. She has a talent for keeping every paragraph vibrant in the manner of a first - rate fiction writer, let alone an academic. But the book is anything but fiction, and the fact that it is not adds to its richness. The book has one structural weakness that the reader can remedy on their own if they know to do so. Mania, in and of itself, is fascinating and complicated. By the third chapter, I wanted more medical background to better appreciate the poet. Half of the way through, I craved it. Jamison had me hooked, but I was not appreciating all that she had to say about Lowell's life circumstances. She brings the disease alive at Chapter 9 and again in Chapter 13 (the best of the book). Jamison does give a fine clinical description of the disease. Unfortunately, she has hidden it in Appendix 2. In future editions, it should be worked into the main text after the 2nd or 3rd chapter. I encourage the reader to start with the appendix or check it within the first half of reading the book. Mental illnesses are very diverse and poorly understood by the public and very often by doctors as well. Lowell's life needs to have maximum context from the beginning to best orient the reader. The book's subtitle lists genius, mania, and character as topics. The text is strongest on the topic of character, then mania, and lastly genius. Given the order, some more space could have been allocated to his poetry with a few more examples showing where his genius lay early on. A larger amount of direct commentary on the verse would be helpful to tie it to Lowell's mania. Redfield does note, "manic patients use more adjectives and action verbs and more words that reflect power and achievement," but these points could be referenced to specific verse examples more frequently. It is not entirely clear how Lowell has more genius than other poets. Chapter 13 brings his writing alive (it is about death, after all) in the more dissected manner that poetry often requires for a novice to quickly appreciate. My own unfamiliarity with Lowell limits my full appreciation of Jamison's work in this regard.